Some hoodlums started a street fight on Olorogun Street, Odo Eran, in the Itire area of Lagos State on Tuesday, during which a 21-year-old stabbed a landlord, identified as Alawu Lateef, to death. Punch Metro learnt that Lateef, who was a father of three, had intervened in the fight, and asked the hoodlums to leave the area, when one of them, identified as Lati Elepo, stabbed the landlord. It was gathered that the father of three slumped, while residents arrested Elepo before he could escape with the other hoodlums. The matter was said to have been reported at the Itire Police Division. A Punch correspondent learnt that the hoodlums, numbering six boys, had come from Osindero Street to meet one Balogun, who they claimed owed them about N30,000. It was learnt that when the hoodlums did not meet Balogun at home, they started to make trouble on the street. The landlord, Lateef, who worked as a panel beater, was said to have asked Elepo to leave the area with his gang members. The hoodlum, however, stabbed him in the chest. Friends and family members rushed the landlord to a private hospital in the area, from where he was referred to the Lagos University Teaching Hospital, Idi Araba, where he was confirmed dead. His corpse was afterwards brought to the Itire division. 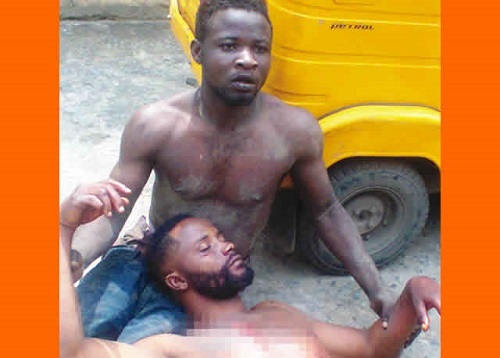 When Punch Metro visited the area, one of his neighbours, who identified himself simply as Rashidi, said Lateef did not have any business with the miscreants, but only tried to pacify them when Elepo stabbed him on the chest. Rashidi added that Elepo and two other suspects were arrested by the police. He said, “It was at about 11am when these boys from Osindero stormed our street. They are teenagers. They are not cultists. They said Balogun owed them N30,000 which they must collect from him. “Lateef did not want such commotion on the street. So, he came out to caution them to take things calmly. The one who stabbed him was drunk. The landlord’s wife was said to be too distraught to talk with PUNCH Metro as of the time of visit. Policemen visited the street in the evening and raided other suspected hoodlums lurking in the area.